Vegetable families sounds like a sophisticated concept when in reality it is very simple: know which crops are related and either keep them together in the garden bed, or prevent them from following one another when practicing crop rotation. Crop rotation is basically what it states: rotating annual crops from bed to bed or from one area to another within the bed so that no one crop is grown in the same place twice. This is one way of naturally controlling pests and diseases in the garden. Members of the same family tend to attract the same pests, and tend to be prone to the same diseases. Often times the offspring of these pests, and/or the bacteria that cause these diseases can be found in the soil. Locating the plants elsewhere the following season will help keep your garden healthy. How much time in between each crop? It depends on who you consult. Different gardeners and different sources will say different things. Some will claim that years between certain crops is necessary, while others don't rotate at all. I know of one seasoned gardener who felt his tomatoes grew perfect in a specific spot and kept them there year after year. He never had a problem with nematodes. Since this is our first year on our homestead we're still working out our garden plan but typically we rotate from one season to the next, counting spring to spring as one full growing season. We have found that amount of time between crops to work well for us. Know that your area and your garden will be unique. Carefully document each crop as you come up with an effective plan that works for you. Why talk about vegetable families and crop rotation now? We're heading into the fall season. For some of us, including me, the fall isn't the end of the growing season, it is simply the beginning of another — a fresh start. In mid-August I repeat all of my cool season crops such as peas, lettuce, Swiss chard, kale, and cabbage; while my tomatoes, squash, and cucumbers will continue to produce until fall (provided the heat and pests didn't take them out). It gives me an opportunity to further tweak my plan if we didn't have great success in the spring. Even if you don't plant a fall garden, fall is an excellent time to plan for the coming spring. It's a great time to look over the past growing season and evaluate what worked and what didn't. What pests and disease did you encounter? What varieties seem to produce better than others? If you did have issues (and every gardener does) consider planting that crop in a different area next spring. And what does this have to do with vegetable families? 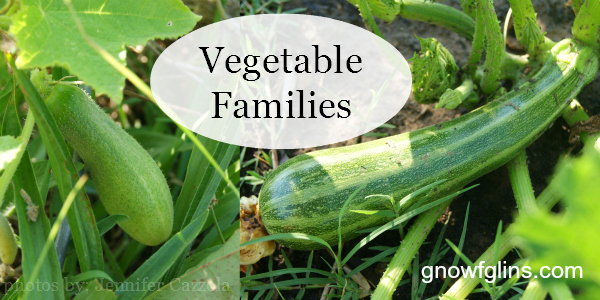 One of the keys to successful crop rotation is knowing your vegetable families. You can plant all members of the same family in the same row or bed and then rotate the following year to another row or bed. Or you can strategically place them in different areas of the garden, taking care when planting the following season. Below, I'll list some of the most common families, including the “fancy” name as well as the more common; some growing tips, and some shared pests, diseases, and other issues. The onion family: garlic, leeks, shallots, and onions. I particularly love to grow garlic because it is planted after the garden rush: late in the fall when I have plenty of time to attend to it. And, it requires very little upkeep. I put the bulbs in, they grow, and I harvest them the following mid-summer, cure them, and enjoy using them in the kitchen thereafter. I've had few, if any, problems with pests and disease. In fact, these are great crops to plant in amongst some of your other veggies to help keep pests at bay, and do well following squash and lettuce. This post will give you more information on companion planting. …also called the goosefoot family. I'm not sure why, but this grouping is all things spinach and that includes lamb's quarters. If you look at the leaves of lamb's quarters they do resemble something of a goose foot so perhaps that is how the odd name came about. The beetroot family also includes beets (obviously), quinoa, and Swiss chard. These crops tend to be heavy feeders and like a moist wet soil. They will also tolerate a certain amount of shade if you have a part of the garden that does not get quite as much sun. They are a cool weather crop, and in my zone, if properly protected will produce through the winter. These can also be referred to as crucifers, cole crops, or more commonly: the cabbage family. This bunch includes cabbage, kale, radishes, mustard greens, turnips, broccoli, cauliflower, bok choi, arugula, and also horseradish. Brassicas are another cool weather crop and any of these would be an excellent choice if you are thinking of planting a fall garden. Common pests include the cabbage worm. Use aromatic herbs planted amongst your crucifers to help deter the moth. I've also seen this family referred to as the marrow family, or more commonly: vine crops. This group includes summer and winter squash, melons, pumpkins and cucumbers. While we think of most of these as vegetables and use them as such in the kitchen, they are actually fruits. These plants produce both male and female flowers with the female producing the fruit we eat. A common pest is the squash vine borer, and since they enter through the soil and do their damage, crop rotation would again be recommended. You can read more about how to naturally deal with the squash vine borer in this post. This is where the lettuces belong, as well as artichokes and sunflowers. While sunflowers and artichokes require warmer weather lettuce likes the cooler temperatures. If carefully protected in a cold frame or under a floating row cover it can last through the winter. Lettuce will also tolerate some shade if you have an area of the garden that gets less sun. These are the bean and pea family. These include the beans of all sorts: bush and pole; and peas as well as some cover crops such as alfalfa and hairy vetch. These crops help add nitrogen to the soil and can be planted wherever a boost is needed. After harvesting, till the remaining vines into the soil, provided they are healthy. As a general rule, I don't fertilize my legumes after the sprouts reach about 2″ tall. Beans tend to be a warm weather crop. Depending on your zone and your first hard frost date, they can perhaps be planted late summer for a fall harvest. Peas on the other hand will tolerate some cold and can be planted a little later on. Consider planting them after a crop of kale. These are also sometimes referred to as the potato family. Nightshades include tomatoes, peppers, eggplant, and potatoes. These are a warm weather crop, although in my zone, if carefully managed through the heat they will continue to produce until frost. Any green tomatoes at the end of the season can be harvested and eaten, pickled, or stored in a cool, dark place to ripen. I've harvested sweet red peppers as late as November. While some of the other families may tolerate growing the the same area if need be, nighshades are one group with which you want to be careful. Nematodes: pests that attack the roots of the plant, are found in the soil. For that reason, you want to take care that your peppers and eggplant do not follow your tomatoes from season to season. Think carefully when laying out your garden plan. If you are a new gardener some of this information can be overwhelming. If you are an experienced gardener some of this information can be overwhelming. My advice is: don't over think it. Be willing to take risks, experiment, and learn from your mistakes. If you don't manage to rotate your crops effectively for the first few seasons, or if you inadvertently plant your peppers in last year's tomato patch, don't worry about it. Keep going and take joy in the fact you are learning to provide your own food. Do you practice crop rotation in your garden? What is your favorite vegetable family to grow? As I started reading this (well written!) article, I had a hunch it was going to be by Jenny. I love the information Jenny shares and her writing style. Thanks for sharing this! The hardest thing about rotating crops, for me at least, is the lack of space. We have a small garden area, and even smaller area that gets enough sun for beans and tomatoes. One solution is that we mix in lots of compost, and try to trade some of the soil between the two beds. I’ve never had huge problems with pests in the past, but this year, my tomatoes got something (I haven’t looked it up yet), and they were planted in a new place outside the beds. Go figure. Gardening is an art as much as science.